These taste like my savory Parmesan Crisps from Nourished, but they are bigger and thicker with a lovely soft crunch. They have a few more carbs (0.7 net grams compared to 0.02 net each) but are still very, very low for a nice, substantial cracker. Directions: Preheat oven to 300°F (150°C). Cut two sheets of parchment paper to fit inside large baking sheet and lightly grease one side of both papers. In medium bowl, whisk together almond flour, Parmesan, sweetener, baking powder, and salt. In large bowl, beat egg and melted butter together until blended. Add dry ingredients and stir until it forms a smooth, stiff dough. Form dough into a ball. If dough is crumbly, stir in a little water, one tsp (5 mL) at a time, until it comes together. Place one piece of parchment paper on work surface, greased side up. Place dough on paper. Cover with second sheet of parchment, greased side down. Roll out dough with a rolling pin to form a rectangle, slightly less than 1/4-inch (60 mL) thick. Peel top paper back and use greased chef’s knife to cut dough into 40 to 42 squares. For clean cuts, position knife and press straight down rather than dragging knife. Dough left over after cutting can be gathered up and re-rolled for more crackers. Sprinkle crackers with salt and pepper. Replace top paper and lightly press salt and pepper into dough. Remove top parchment and lift bottom parchment with crackers and carefully place on baking sheet. Bake 20 to 30 minutes, or until nicely browned. Rotate pan after 10 minutes or use convection mode for even baking if your oven has that feature. Lift parchment paper with crackers and place on rack until cool. Store in an airtight container. *Sweeteners with bulk include Swerve®, Sweet Perfection®, Truvia®, or any of the blends made with erythritol, inulin, or oligofructose. Finely powdered sweeteners, like Swerve®, Sweet Perfecton®, and Just Like Sugar® work best for baking. Granular sweeteners can be ground in a spice or coffee mill, if necessary. 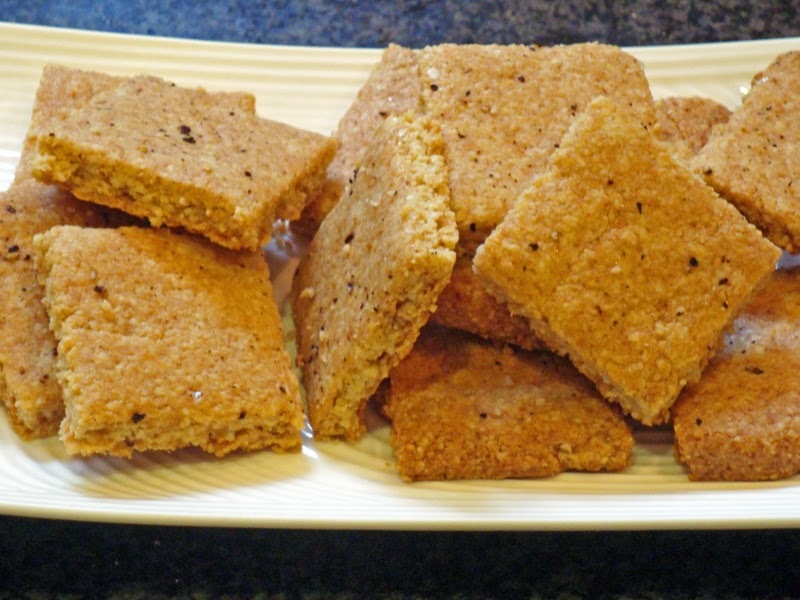 Gluten Free, Grain Free, Parmesan Crackers. Bookmark. Me too, Tes! Xylitol should be fine. I love the taste and how it works in recipes, but can't eat very much or it makes me sick–this amount is not a problem though. Looking forward to making these. I wish you didn't have a black back ground as every recipe I print from your site takes a lot of ink. Love your recipes just wish when i print them out they were not on a black back ground, takes lots of black ink. Diana, does it really print out as white on black for you? My printer prints it black on white. Please let me know and I will see if there is a way to fix the problem. As I said above, if you view it on another device, it will have a white background. Glad you like the recipes! Is one serving, one cracker? One cracker is 0.7 carbs? I just want to make sure I am reading it right. Thank you! Anonymous: Yes, the count is per cracker–it's easier to track that way. I put some in the freezer to keep from eating too many, as they are pretty addictive. Anonymous, I'm stumped as to the white on black print problem. Does any one know why it seems to do that for some people and how to fix it? re: printing- I wonder if it varies by browser? Print preview shows white on black for my Firefox, though I haven't tried printing yet. One work around for folks would be to select/copy the recipe and paste (use "past special" option and chose text only) in Word. then it will be black on white. THANK YOU, Sue Boggs! I'll remember to suggest that to anyone having a problem.